Our latest trip was to the Amazon again, this time to the ZF2 forest site, north of Manaus, central Amazonia. 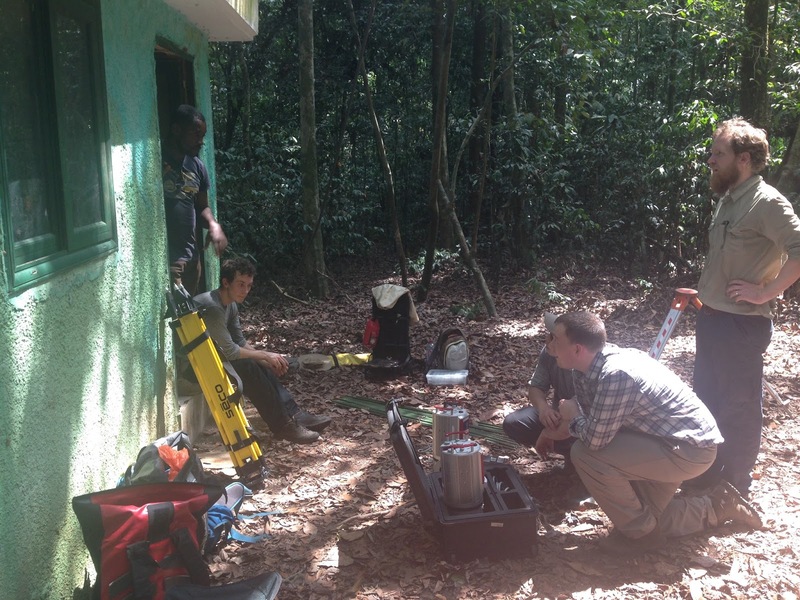 Field station at the ZF2 research site. The Brazilian government are funding an extremely ambitious new Free Air CO2 Enrichment (FACE) experiment at the site, to try and answer the question "What will the Amazon rainforest response be to elevated CO2 levels over the next century or so?" See the Science feature on the experiment from May 2016. 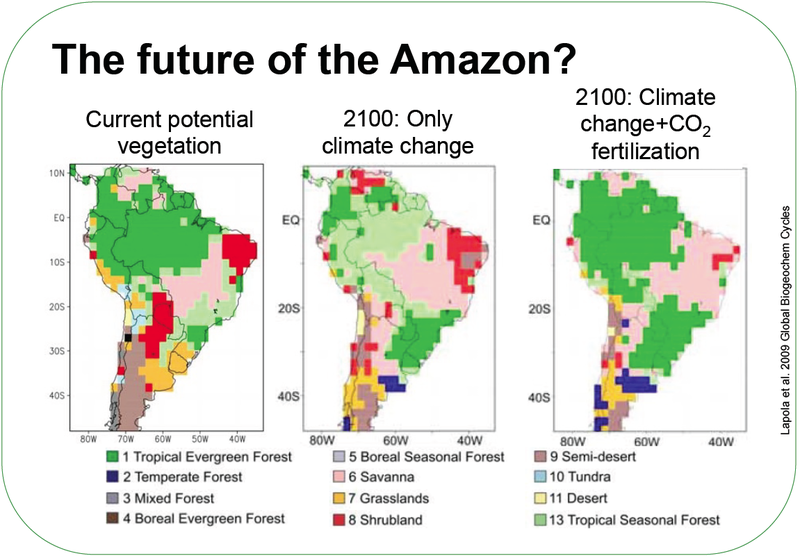 Model projections of change in the Amazon over the next century. From Lapola et al. (2009). 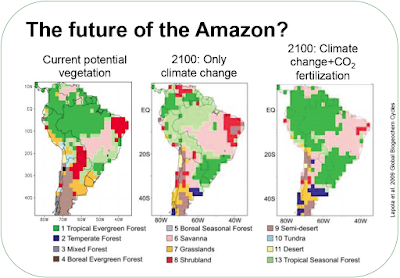 These FACE experiments are a well-established, if logistically challenging way to take a peek into the future and look at large-scale ecosystem response to climate. FACE experiments are an attempt to duplicate the kind of treatment/control replicate lab experiments we are all familiar with. But full scale! 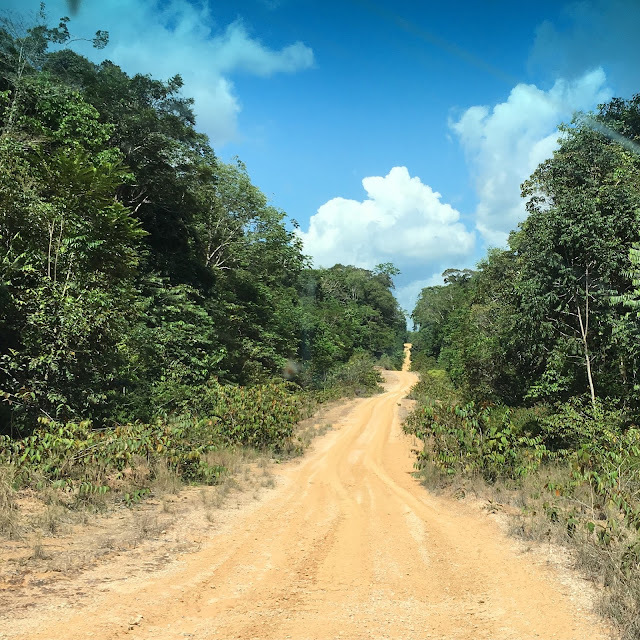 There have been a wide range of these projects over the last 20 years or so, in a range of ecosystems, but never in the Amazon. Until now. 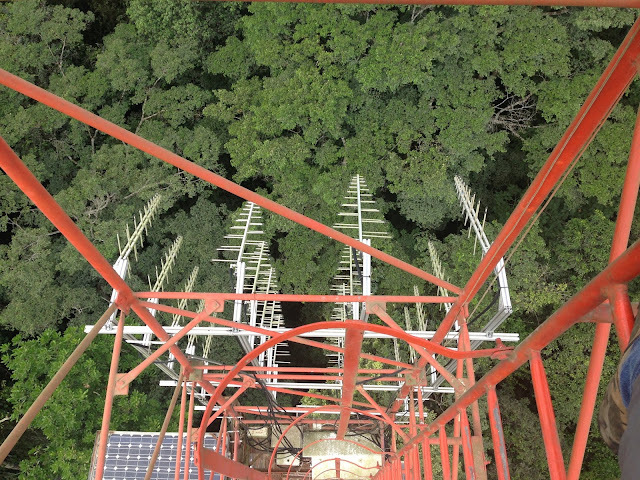 Upward-looking panorama of the FACE ring tower and canopy. AmazonFACE is establishing 8 30m diameter rings, each with a tower in the centres, which will have CO2 piped into the canopy, raising the ambient CO2 to around 600 ppm (50% or so above current normal levels) for the next 10-15 years. The rings span a range of forest conditions, and have paired plots fairly nearby which will be the controls. Within the rings, and at the wider site, the climate and wide range of soil, plant, biotic responses will be measured, as the rings are established and the CO2 is switched on (planned for start 2018). 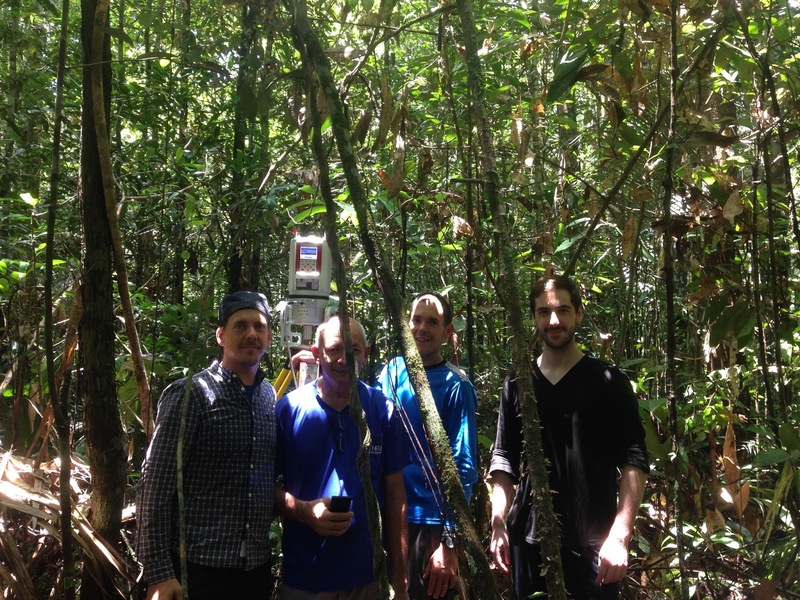 We were very privileged to be invited by Prof. David Lapola and his AmazonFACE team to come and use our lidar to scan the FACE rings at the outset of the experiment, to try and characterise the plot biomass and structure. We also aim to establish a baseline of the canopy structure against which future changes can be compared, as well as to try and unpick the structural differences between the rings at the outset. A single scan from our Riegl, centred on the middle of one of the AmazonFACE rings (colour is vertical height, from blue to green). A close up of a single scan within the ring above, showing the tower at the centre. 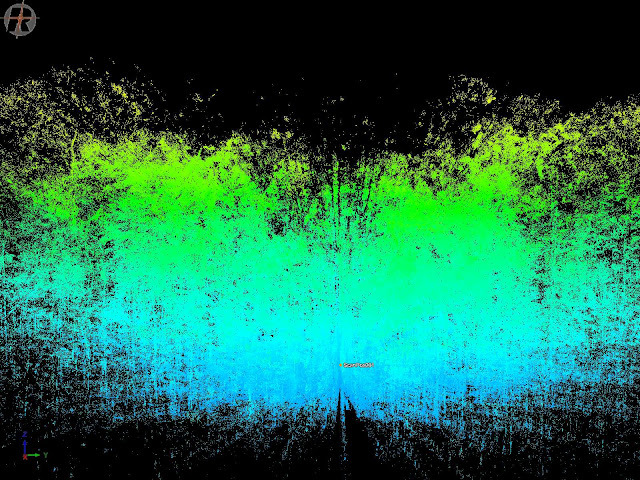 Some of our reflector targets can be seen in bright red to the right of the large tree in the centre (colour represents return intensity of the laser pulse, from blue to red). 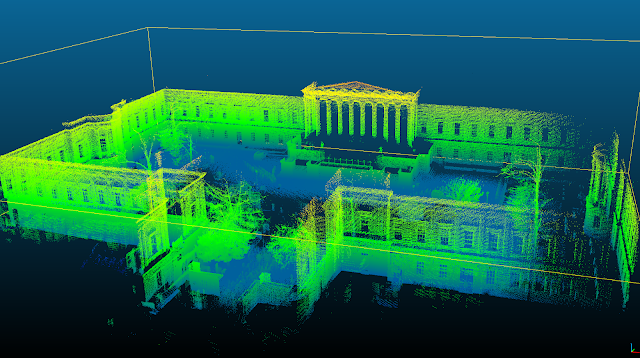 Top view of scan taken using our ZEB-REVO mobile laser scanner, with the tower visible in the centre (colour represents vertical height, from blue to green). After some amazing logistical and paperwork help from David and his team, particularly Bruno Takeshi who is the guy who does everything (including driving through and over and fallen trees! ), Matheus and I spent a very busy few days scanning the FACE rings with our lidar. We had a great deal of help from Dr. Florian Hofhansl, the resident ecophysiology expert, and other station researchers. We collected 8 rings with our Riegl and I also managed to scan them with our GeoSLAM ZEB-REVO. Florian's overview of the experiment is really informative, with detailed maps and plans etc. Check it out. Despite some minor travel hiccups (losing not one, but both our laptops, on different flights; we got them back, albeit one only on the way back out), the occasional unseasonal tropical downpour, fallen trees and getting savaged by some tiny horrors (me), the expedition has been a great success and I'm really excited about the results. 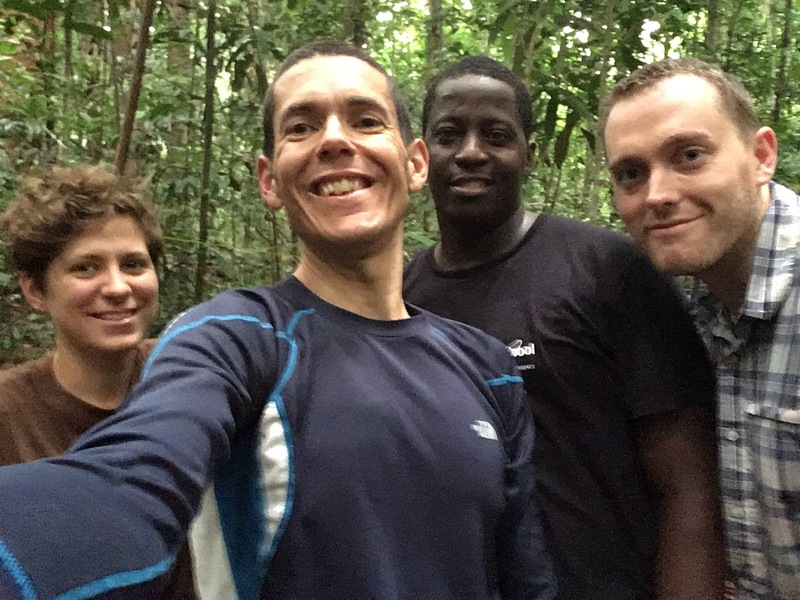 It's also been great to establish some new research collaborations with the Brazilian AmazonFACE team and their colleagues from elsewhere. Huge thanks to the team and cNPQ, INPA and the colleagues, for bringing us out and organising the trip. 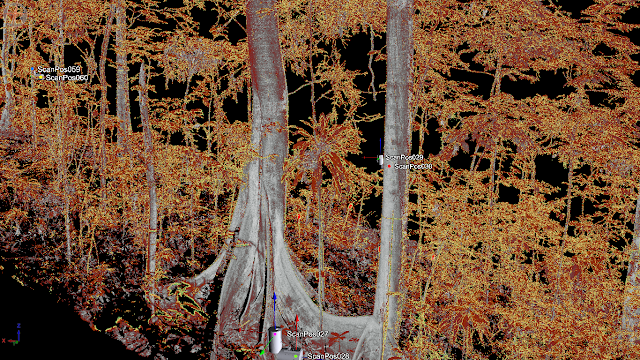 Cross section (few cm in depth) of the ZEB-REVO scan, showing some of the tree trunks. 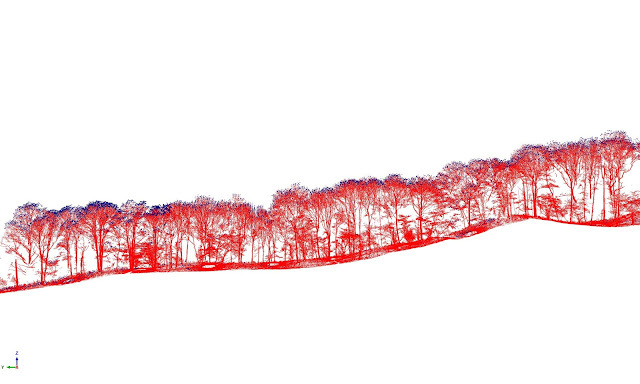 Oblique slice through a Riegl scan. We were faster, but maybe not by much. 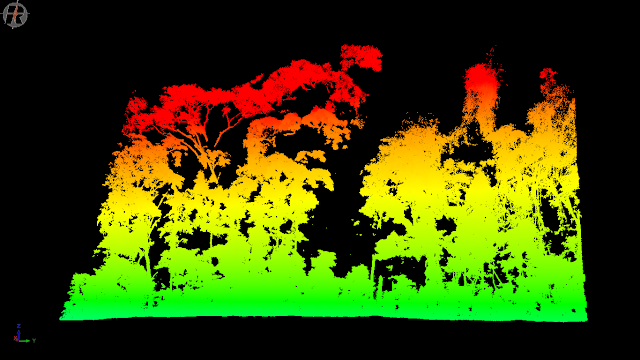 Karen Anderson has written a really nice blog post on our recent paper "A comparison of LiDAR approaches for vegetation and landscape characterization" (published in the open access Remote Sensing in Ecology and Conservation journal). Karen's blog "Weighing up the benefits and costs of waveform LiDAR", and hosted on the ZSL blog site, outlines some of the benefits of waveform lidar for ecology. 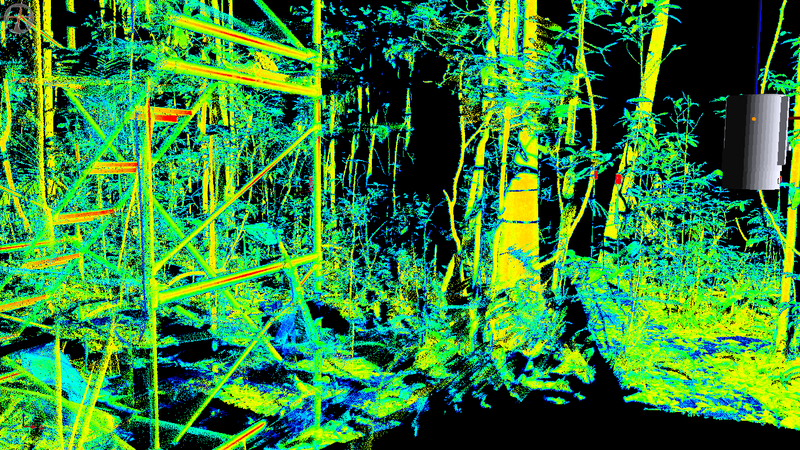 Our work shows how waveform lidar can provide habitat measurements that just aren't available any other way. Karen concludes that the next few years are likely to see an explosion in applications of waveform lidar in spatial ecology. Andy's been busy processing the Ghana data. First cut from this is a flythrough - low res at the moment but you can see the tower at the start, and the topography towards the end. This was ..... a challenge shall we say. 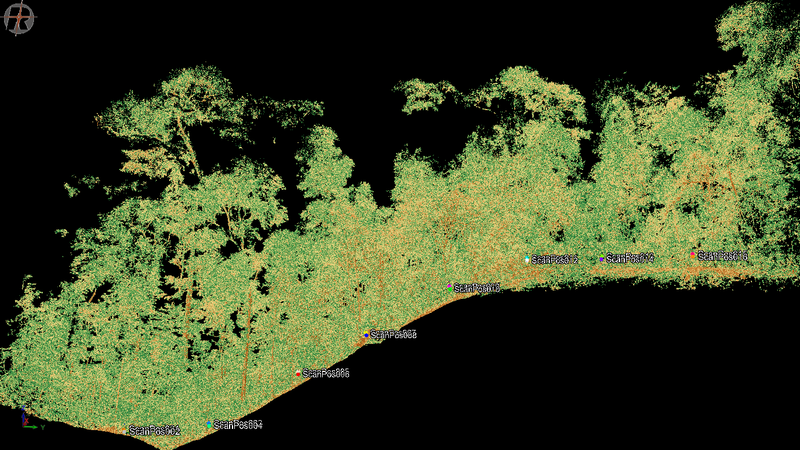 Andy's also pulled out the 17 largest trees in the ESA AfriSCAT RADAR footprint - and the poibt cluds, and the resultiung models, are shown below. 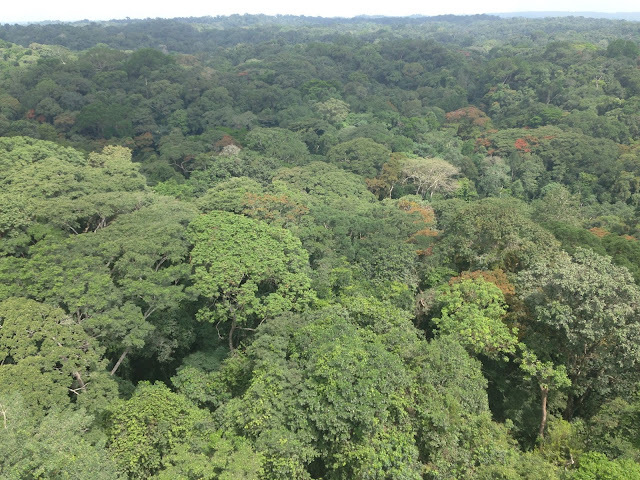 Our initial estimate is that there's around 150 t C in these 17 trees, probably close to half of the total for the whole plot! Point clouds of 17 largest trees in the plot, extracted automatically from the co-registered full point cloud. Colours are just to differentiate each tree (same below). Initial results from fitting cylinder models to point clouds. Mostly looking good, and the volume estimates seem robust from the parameter variation. 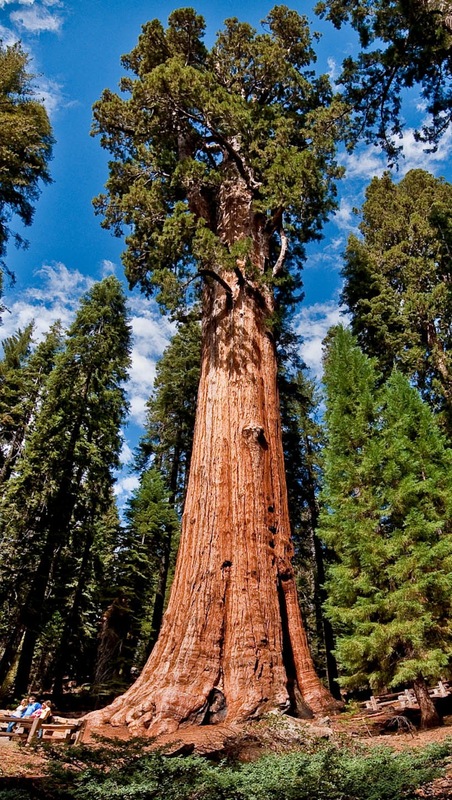 More tree models to follow! While we were away in Ghana, our new "toy" arrived, the ZEB-REVO hand-held TLS instrument (or Zebedee). 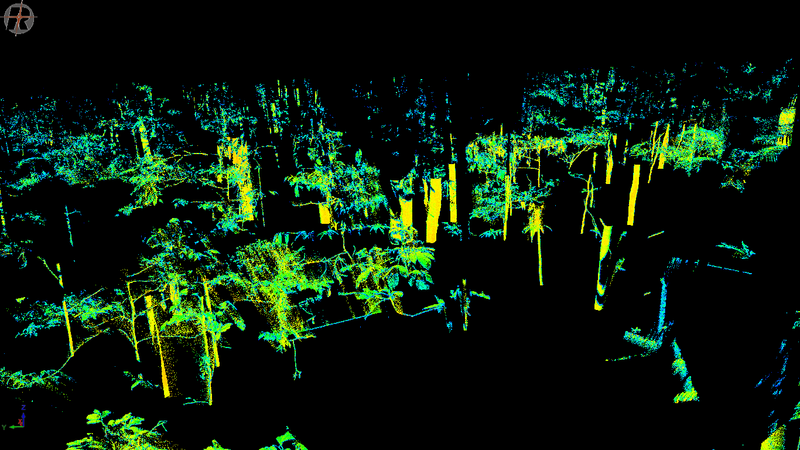 I say "toy" because it's not - it's a highly-portable laser scanner, developed by CSIRO in Australia, with much lower power and range than our Riegl but with correspondingly much lower weight, hence the much greater portability. It's designed to be used on mobile platforms - cars, UAVs and the like; the platform in this case being our legs. 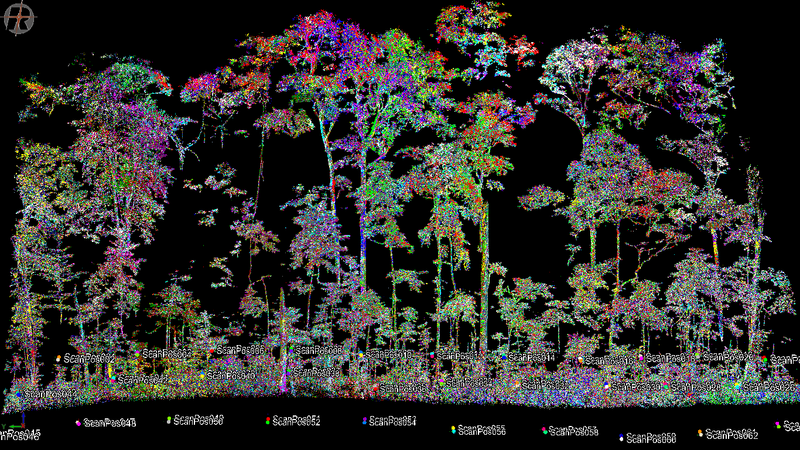 The idea is that we can use it to augment the Riegl, combining both to provide additional information in environments where we may find it hard to move the Riegl around and/or where the understory causes a lot of occlusion. First tests show it's *very* easy to use, which is a key point. 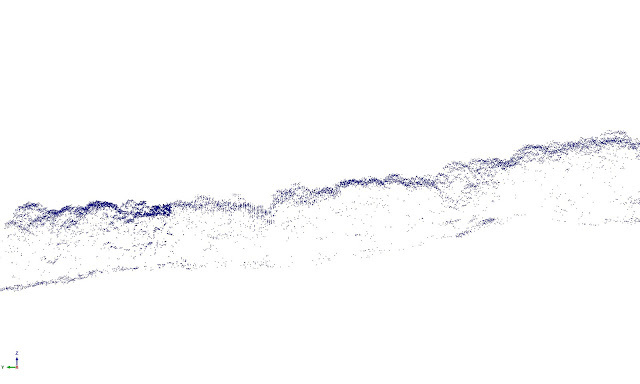 Also, so far I'm impressed with the SLAM software that automatically co-registers all the data into a single point cloud. It seems to work well as long as you capture enough objects & targets that the software can identify in post-processing. I'm really looking forward to getting it out into a real forest environment with the Riegl to start experimenting. The Ginkgo trees in the UCL quad, done in around 1 minute, with ghost Lewis's everywhere. A rather more careful and complete scan done by Phil of you know where. An animation of a walking down Gower Street, done by Kim. And below, a quick look inside the Dept. 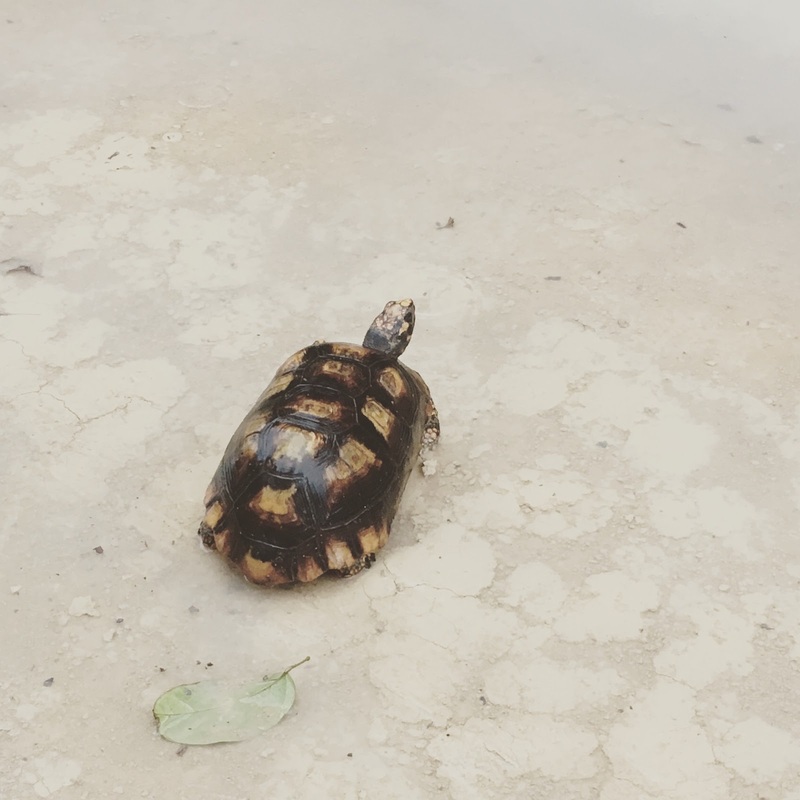 from a walk out of the lab and down the stairs. And finally .... Ewan's nice picture of two great minds at work. Look, how hard can it be, just switch it off and on again. We're all very proud of Kim, who was recently announced as the winner of the British Ecological Society Methods in Ecology and Evolution (MEE) RobertMay early career researcher award (see http://www.britishecologicalsociety.org/grants-awards/honours_awards_prizes/prize-for-the-best-paper-by-a-young-author/robert-m-may-prize/). Kim won for his paper "Nondestructive estimates of above-ground biomass using terrestrial laser scanning" (seehttp://onlinelibrary.wiley.com/enhanced/doi/10.1111/2041-210X.12301). 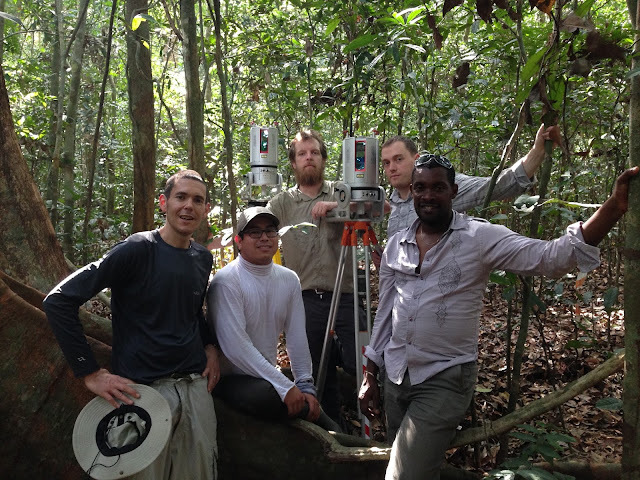 The paper was the culmination of Kim's PhD work, and involved many of our long-term collaborators, and it was a key piece of evidence vindicating our approach to using TLS to estimate biomass. 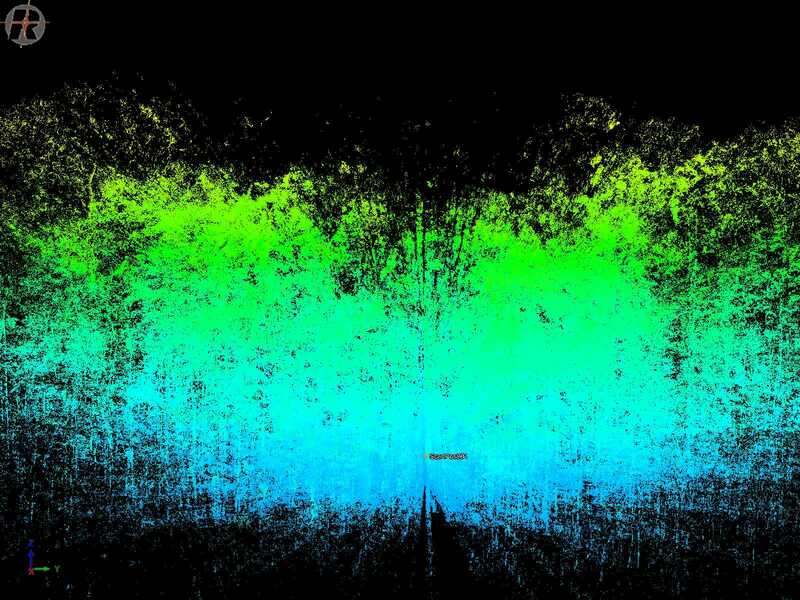 Kim's paper received quite a lot of attention when it was published, featuring on the UCL News front page amongst other places (see https://www.ucl.ac.uk/news/news-articles/1114/211114-laser-scanning-weighs-trees), and has already been cited 30 times in less than a year. I'm not surprised, and I've no doubt it will go on to be cited many times, given its groundbreaking demonstration of the maturity of TLS for biomass.